The Little "Q" Model Railroad Club of Aurora, Illinois was organized in September of 1958 and is celebrating its 35th anniversary this year. The club's name comes from the Chicago Burlington & Quincy Railroad, which built its first shops here in Aurora, 38 miles from Chicago, and was often called the "Q". According to our earliest notes, Little "Q"'s original objectives were to promote and share model railroading with the Aurora area people, as well as to build and operate scale equipment. Today, our constitution says that the club is to "benefit further knowledge in railroading and the model adaptation of railroading," and our portable layout promotes the hobby throughout the Midwest. The club's first layout was built in the old Aurora Post Office; unfortunately, that building was torn down in 1962. Beginning in late 1961, the club moved to the Copley 2 Recreation Center of the Fox Valley Park District. Little "Q" still occupies its portion of this building today, enjoying the view of the Burlington Northern mainline 100 yards from the front door as well as the heaven-sent terms of free rent and utilities-- our primary obligations are to hold a public open house once a year and to provide manpower for the Park District's annual Halloween Ghostwalk, where our assignment is to assist people getting on and off an amusement park train. There are presently 33 active senior members and 2 junior members, as well as 10 or so associate members. Meetings are Thursday and Saturday nights from 7 to at least 11 PM, and visitors are always welcome. In 1976 the first layout in this building was dismantled and construction of the present layout was begun. Its dimensions are approximately 18 by 36 feet, with the lowest track level 44 inches and the highest 54 inches above the floor. The benchwork is "L" girder type construction, with plywood sub-roadbed and, in most areas, 1/4" by 1-3/4" pine lattice (available in the millwork area of lumber yards) for the roadbed. Track is code 100 flex track, except for the interurban line's street trackage, which is code 70 guardrail flex. The minimum curve radius on the high line is 48 inches, with 36 on the other route. Many turnouts are custom built for the locations they occupy, and most others are either Peco or Shinohara number 8. 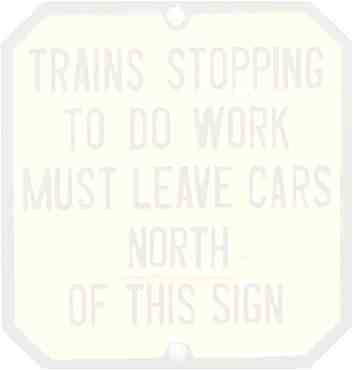 The at-grade crossing of the 2 mainlines, known as "the diamond," is also hand-made. The interurban line underwent a complete rebuilding a few years ago, and is mainly in the front of the layout. It can be operated by either overhead wire or 2-rail. There are about 1500 feet of track on the layout, with 100 feet under wire. Four mainline operating cabs and a dispatcher's panel are at one end of the layout. There are also 8 local yard or industry cabs, and when the interurban is counted, as many as 14 people can operate at once (although it does get a bit crowded!). Wiring is simple blocks with lights that indicate when someone has a block turned on. Switch machines were originally twin coil type with diode matrices and pushbuttons to select routes. These were replaced with military rotary relays, which threw just as violently (maybe more so) as the twin coils, and therefore often broke the linkage to the switches--usually during open houses, in accordance with Murphy's Law. 1992 saw the completion of a conversion project to Tortoise slow motion switch machines. The club has a large collection of rolling stock and a fleet of locomotives for those members who choose not to bring their own to run. Locomotives are painted in a modified version of the CB&Q red and gray scheme, and the Burlington influence also shows up in many of the members' equipment. However, almost any road in North America, past or present, may show up. Like any layout, this one is never finished, although we try to wrap up construction projects in time for the annual open house. A project to install operating signals on the mainlines stalled because the small photo cells being used are no longer available. On the other hand, in the last few years an amusement park has been built along the interurban line, where it crosses the creek. The park has a ferris wheel, picnic tables, fireplaces, and an operating merry-go-round. In addition to the permanent layout, Little "Q" also has a portable layout which is transported to a number of public shows as far away as Toledo, Ohio, and St. Paul, Minnesota. Although we once did 24 shows in single year, we now try to limit ourselves to approximately 18 per year. This figure includes at least 10 of the monthly Great Midwest Train Shows in Wheaton, Illinois, plus the Boy Scout Railorama in Dundee, Illinois, the NMRA DuPage Division's All American Railroad Show in La Grange (only a couple of miles from EMD), and Railroad Days celebrations in both Plano and West Chicago, Illinois. The 8 by 32 foot portable layout is constructed with 3/4 inch plywood on top of a 1 by 4 inch pine frame. It is composed of two 4 by 8 foot end sections separated by six 2 by 8 foot sections, leaving an area 4 by 24 feet in the middle for the operators. The layout is designed with public display, rather than prototypical operation, in mind. Each of the 3 mainline loops is Tru-Scale Ready Track, and the branch line and trolley loop (again operable by either 2-rail or overhead) are code 100 flex track attached directly to the plywood and ballasted. Most buildings, structures, vehicles, etc., are removable and are stored in metal boxes for transport. Most of these buildings are kits built by club members, although some were purchased already assembled. Frequently at public shows we are asked "How long did it take you to set this up?" You should see people's faces when we truthfully reply "About an hour." The purpose of our portable layout is to further promote model railroading and to help us have fun and meet new people. This layout has been in operation for about 15 years, beginning as a simple 4 by 8 footer and gradually expanding in 8-foot jumps to its present 8 by 32. This is about as large as we can go, given the size of the display areas normally available to us and the capacity of our trailer, which the sections simply slide into. Every couple of years, a portion of the layout is redone, giving it a new look. We also try to not display the portable layout to the public in an unfinished condition. Let's now take a tour of the Quincy Terminal Railroad and its subsidiary, the Quincy Electric. Our special inspection train consists of former California Zephyr dome/observation car Silver Penthouse, privately owned by a company official. It is being pulled today by Quincy Terminal 505, one of two General Electric Dash 8-40Cs financed for us by GATX. As we pull out the west end of the commuter yard at Murphy Junction (named for one-time CB&Q president Harry Murphy), we pass a small park with the only known preserved New York Central Hudson. Coming up on the left as we curve to the south is a 6 track storage yard, while on the right is an immense cotton mill [a kitbashed Heljan brewery, with its back and roof open so the club's PFM sound system can be placed there]. Entering another left hand curve, which takes us eastward, we pass Wagner & Sons Warehouse [Magnuson], then duck under the high line at Water Level Junction, where a gradeless bypass back to the commuter area diverges. Out in the open at the bottom of the high line's embankment, we head downgrade and soon enter a tunnel. This whole mainline route was originally intended to be a heavy electric line like the Pennsylvania or the Great Northern, but management ultimately decided not to install the catenary. Just inside the tunnel is the back leg of a wye and a curve which points us to the west again as we emerge at Darnfield. Here we enter the 4 track yard, which has its own switch engine assigned to serve the numerous nearby industries. From the yard, we back down the interchange to the Quincy Electric, where we get off of the private car. Watch your step! As we wait for the next train at Eastend station, you admire the nearby newly-constructed Hoffa Cement plant [2 Walthers kits, bashed]. Soon a pair of Chicago Aurora & Elgin cars comes along and we climb aboard. After we explain to the conductor and motorman who we are, they're more than happy to let us stand in the front vestibule for an excellent view. Heading west, we pass numerous small businesses on our right. In a minute or two, we enter the city street, being careful not to have a collision with of one the motorists who ignore the crossing lights. The city has been complaining for years that the lights flash whether there's a train coming or not. Having traversed the street without incident, we pause briefly at Westend to pick up a passenger, then enter a tunnel under the steam road. This tunnel carries us a good distance to the south; then, after an extremely sharp curve, we pass under the steam road's soaring truss bridge and come to a stop at Electric Park. Here several families leave the train for a day of fun. On the move again, we cross Blackberry Creek on a rickety- looking wooden truss bridge, and after whistling for a gravel road crossing, duck into a much shorter tunnel. We emerge to again enter the street (the flashers are approach activated here) next to the Electric's single biggest customer, a scrap metal dealer where a couple of derelict diesels can usually be found amidst piles of crushed automobiles. Grinding to a halt and causing traffic to do the same, we have a chance to view the main station in town. It bears an amazing resemblance to the South Shore's depot in Michigan City, Indiana [Bronze Key]. At the east end of the street trackage is the Quincy Electric's 2 track carbarn. We stop again at Industry to let off a passenger who overslept and is late for work, then continue on around the edge of the industrial area. This area is mostly switched by the steam road crew out of Darnfield, much to the disgruntlement of the interurban's employees. Now rounding a sharp curve, we cross the interchange and soon pull up at Eastend again, where Silver Penthouse is still waiting for us. As the big GE diesel pulls us out of the interchange and through the yard, you notice the branch around the hill to the sprawling American Chemical & Potash facility, another major customer which occasionally has its own switch crew. In yet another tunnel, we ascend a major grade while curving around to head eastward again, once more hitting daylight at Harrison Yard, site of a small intermodal facility and a large coal loader [Walthers, modified]. Going under the high line one more time, we also cross it at grade at Hardford Junction, then swing around to the west as we pass Union Tower and enter the 3 track mainline. From our perch in the dome on the north track, we can see the concrete ties which were recently installed on the middle track. This is an experimental project, and management is still evaluating the results. Routed through a high speed crossover at Murphy Junction, we now enter the high line and immediately another curving grade. The lead from Steurer Yard becomes the second main at WH Tower's double crossover, in front of the Climax depot. Here on Grand Ridge, according to legend, there was once a house of ill repute frequented by the train crews. Breaking off from the main here is the branch to the grain elevator and meat packing plant at Rocky Ridge. Looking down from the truss bridge, we have a bird's eye view of Electric Park as our CA&E train makes another stop there. Be sure to wave to the guys painting the bridge. Just before we enter the highest tunnel on the railroad, we zip past the small depot at Murphysboro. Emerging from the tunnel, we find ourselves at Strickland Heights, where the Rocky Ridge branch ties in again. Proceeding westward down the gentlest grade on the mainline, we catch a quick glimpse of the Ponca City Industrial Park before our view is blocked by first a Burlington Northern commuter train, then a long string of intermodal cars, including many double stacked containers. This park has a dedicated local freight train, dispatched twice daily from Steurer Yard, and crews frequently run afoul of the hours of service law while switching here. Rounding a broad, scenic curve, we duck under the Rocky Ridge branch and find ourselves headed east alongside the Water Level route. After we pass under the overhead conveyor from the coal mine to the Harrison loader, we go through Hardford Junction again, but on the other track. Union Tower now lines us through through a very tight, 10 MPH crossover and back into the commuter station. As 505 brings us to a gentle stop exactly where we started this morning, the train crew and company executives thank you for coming for this tour and invite you back for another ride soon. As it has for the past 35 years, Little "Q" always welcomes visitors and new members. Junior members may join at the age of 15 with 2 senior members as sponsors (one if the sponsor is a parent). With our Park District sponsorship, our only major expense is insurance for the portable layout's trailer, so all dues and other income go toward improvements on the layouts. Our annual open house this year is the weekend before Thanksgiving, November 19-21. Hours are Friday 6- 10 PM, Saturday noon-10 PM, and Sunday noon-5 PM. The address is 517 North Union Street, Aurora, Illinois. Admission is free, and refreshments are available. Or just drop in any Thursday or Saturday night. Besides operating the layout, members often watch railroad videos (both their own and professionally made ones), and spend hours viewing slides of their latest railfan trips or nostalgic blasts through the past. If you have any questions, feel free to ask any club member at one of the shows where the portable layout is on display. We will do our best to answer your questions or steer you to someone who can. The author wishes to thank David Hanks, Lee Strickland, and Jerry Hamsmith for their contributions to this article. This page created on 8/9/2001. Last modified 8/9/2001. Copyright © 1999-2001 Little "Q" Model Railroad Club. Photos Copyright © 1999 David Streeter.